Image caption Police and forensic experts are searching the cars in which the bodies were found for clues. 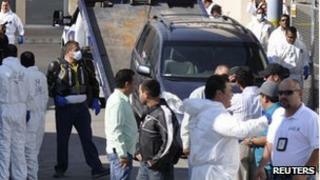 Police in Mexico have found 18 mutilated bodies dumped in two cars in the western state of Jalisco. A threatening note left with the bodies suggested they were victims of a gangland killing. The region has seen a rise in violence as the Zetas drug cartel tries to wrest control of the area from its rival, the Sinaloa cartel. Around 50,000 people have died in drug-related violence since President Felipe Calderon came to power in 2006. Jalisco State Prosecutor Tomas Coronado did not rule out there could be more victims. Initially police counted 12 bodies, but following further examination of the vehicles, they said said 18 victims had been found. The bodies were so badly mutilated, forensic experts have not yet been able to tell if they are male or female. Police found the remains in two abandoned cars by the side of a road leading to Lake Chapala, an area popular with foreign tourists and US expatriates. Officials said they had received an anonymous tip-off early in the morning leading them to the bodies. They said a threatening note found in one of the cars suggested the Zetas drug cartel was behind the gruesome killing. According to US geopolitical analysis firm Stratfor, the Zetas have become Mexico's largest drug cartel operating in more than half of all Mexican states. Jalisco, once under the influence of the Sinaloa cartel, has witnessed a series of multiple murders over the past year. In one of the most recent, the bodies of 26 people were found in three cars in the state capital, Guadalajara, in November.